Great post! Knowing what your franchisees are doing in Twitter is becoming a critical aspect of managing franchise relationships as we it already is crucial for relating to customers. 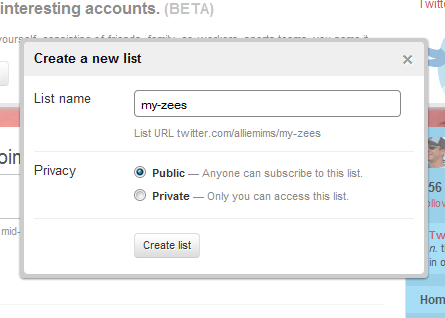 Thank you for the step by step instructions on how to create lists. Great information! Thanks Lizette. I’m glad you liked the post. I agree that Twitter is becoming an important aspect of managing the franchise relationship. Thanks Joel. I’m glad you found my post to be helpful. Great post – Keeping up with the conversation about your brand should include tracking what your franchisees and their employees are saying on a regular basis. I use Hootsuite to make tabs or groups and have 8-10 different groups. I also use http://www.additomatic.com to track keyword searches. Like anything else, if the franchisor doesn’t jump ahead and lead, franchisees will lead in the absence of the franchisor. I’ve found that spending more time on social media and twitter especially is paying off and franchisees are really happy that we are taking the effort to develop the brand in this arena. Hi Thomas, thanks for the great comment. HootSuite is a fantastic Twitter client for organizing and managing Twitter conversations and content around your brand and business. I haven’t checked out additomatic yet, but I will definitely take it for a spin this week. Excellent post. As more and more franchise brands are venturing into social media it’s essential we continue to provide tips, pointers and advice. This will minimize their fears and phobia and make them fully realize social media is not rocket science. Tools that assist them in being more effective and efficient will go a long way towards many more franchise brands embracing social media. Thanks for helping to make this happen. Thanks for the comment Paul. I agree that providing tips, advice, and guidance really helps to reduce a franchisor’s reluctance to engage their customers and franchisees in the social media sphere. I would add that it’s always a good idea to start by asking franchisors why they are hesitant to start engaging folks through Facebook, Twitter, etc. Many will say, as you mentioned, its complicated or “rocket science” or they think it’s a waste of time. In my experience, once you demonstrate the value of social media to a franchisor, most are willing to wade into the social media pool.